Following up on our report this morning regarding the impending release of Nehalem-based Xserves, a reader has turned up hard evidence of the new rack-mount systems in pre-release builds of Mac OS X 10.5.7. 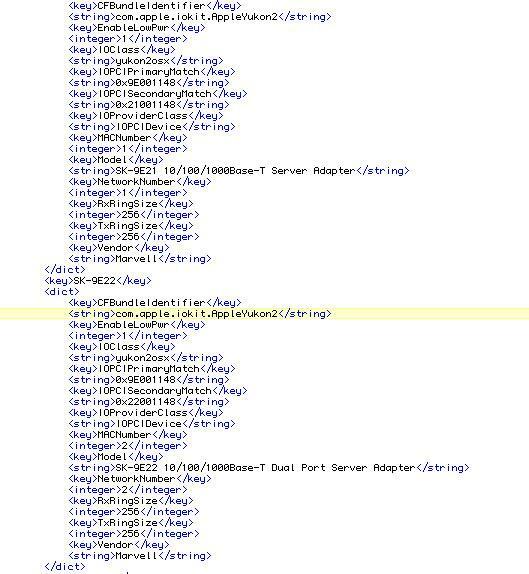 In particular, AppleInsider reader Adam has discovered references to an "Xserve 3,1" inside the AppleTyMCEDriver extension file currently seeding to Mac OS X developers as part of Mac OS X 10.5.7. 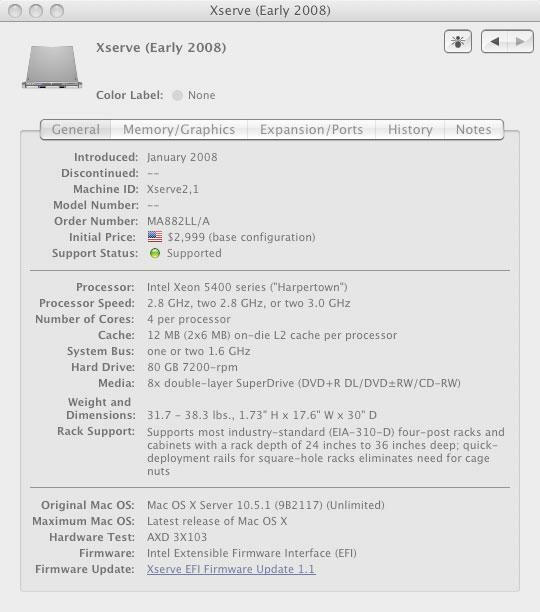 The current incarnation of the Xserve, introduced in January of 2008, has long identified itself as "Xserve 2,1" (screenshot), meaning "Xserve 3,1" stands as an machine ID indentifier for an unreleased family of Xserves —almost certainly the upcoming Nehalem models. AppleTyMCEDriver-nehalem_error_disable %s disables the AppleTyMCEDriver MacPro4,1 Xserve3,1. 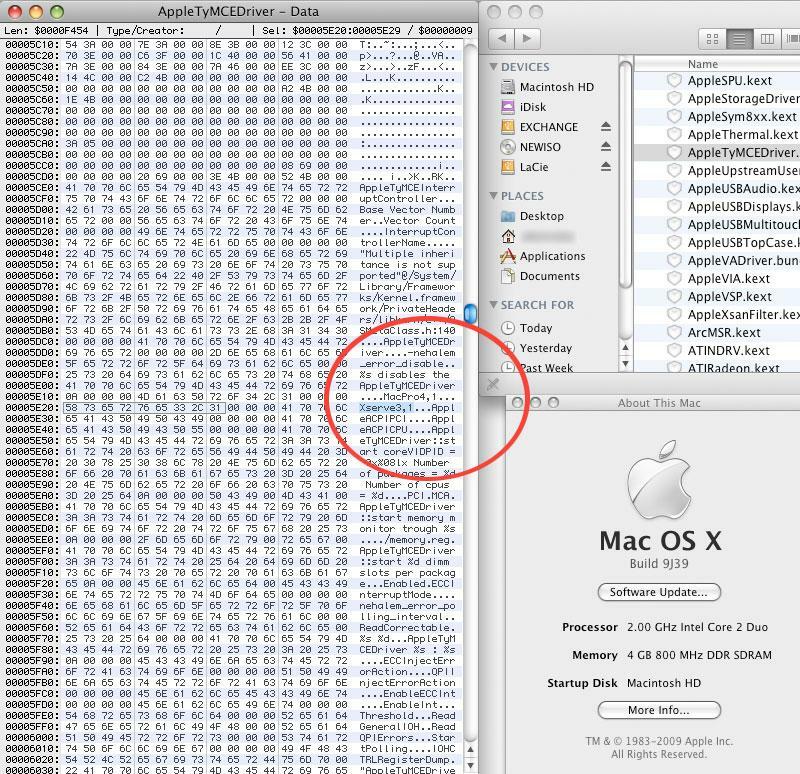 Additionally, Adam also discovered several references to Marvell's Yukon 2 Ethernet controller chips in a recently modified version of the IONetworkingFamily extension files included with Mac OS X 10.5.7 distributions. While these particular controller chips aren't new to the market, they would be new to the Xserve line —the only Apple system suited to adopt such chips. With new Xserves expected as early as the next two weeks, it's possible the new systems will ship with Mac OS X 10.5.7, which is similarly expected for a release sometime in April.